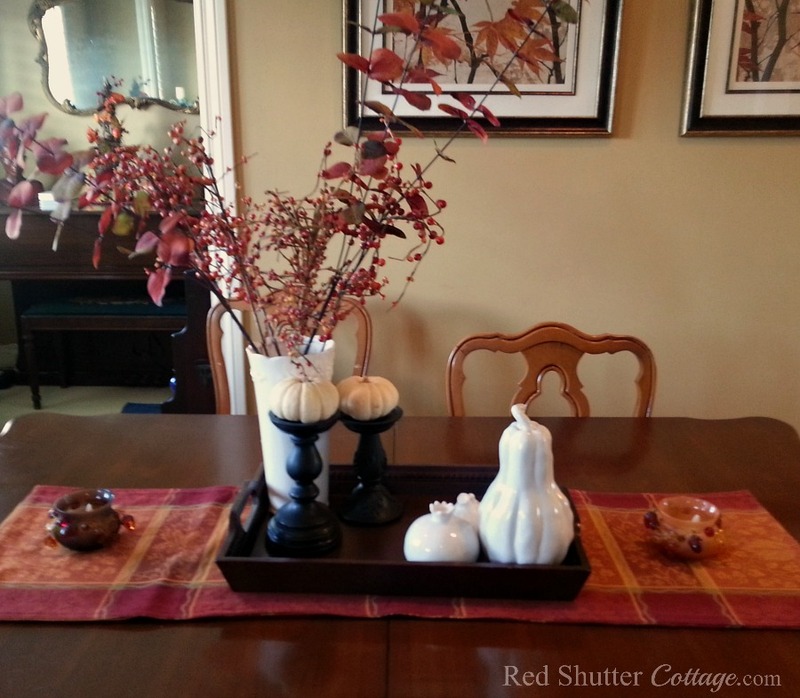 Here are 3 ideas for creating Fall Dining Table Vignettes. 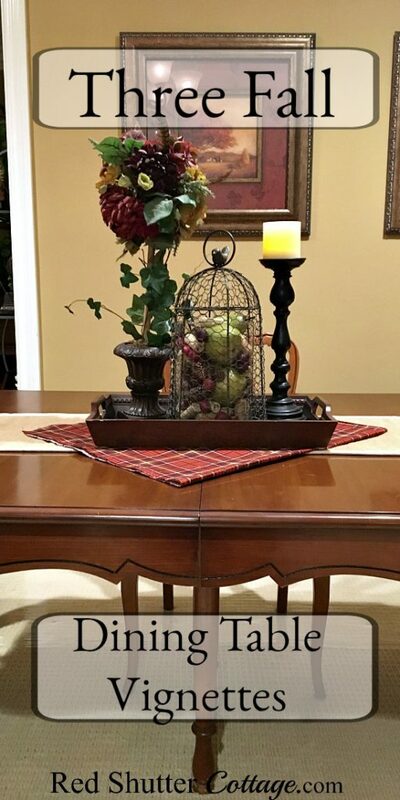 A dining table is an ideal spot to let loose a little creativity and some “Fall Flair”. And of course, coffee tables, shelves, or side tables are great options also! 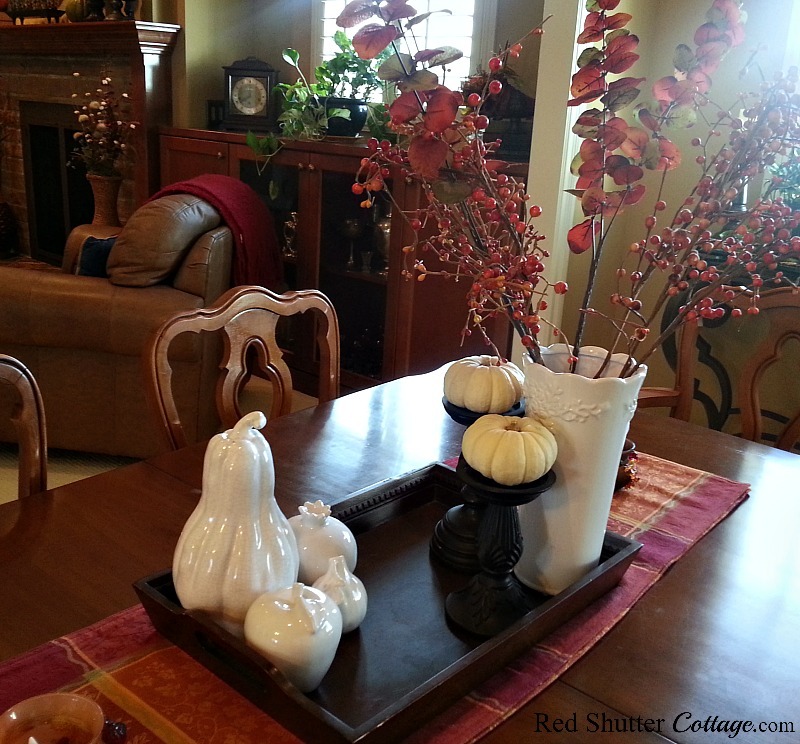 The fall vignettes I am showing here are built by using everyday items I have around my home. None of them are a ‘fall decoration’ in and of themselves. Instead, they are a compilation of decorating items I use all year round, mixed in and dressed up with: fall fruit, fall foliage, berries, wine corks, pumpkins, and fabrics (both fall and ‘everyday’). Over the years, I have developed my own personal method for building a vignette of any kind. When I am working on building a vignette, I try to keep these guidelines in mind: color, texture, contrast, height, depth and volume. In the vignettes I am showing below, I have tried to incorporate at least 3 – 5 of these vignette guidelines. This first vignette is made up of everyday items: a tray, two candle holders, a white vase, and some white ceramic vegetables. 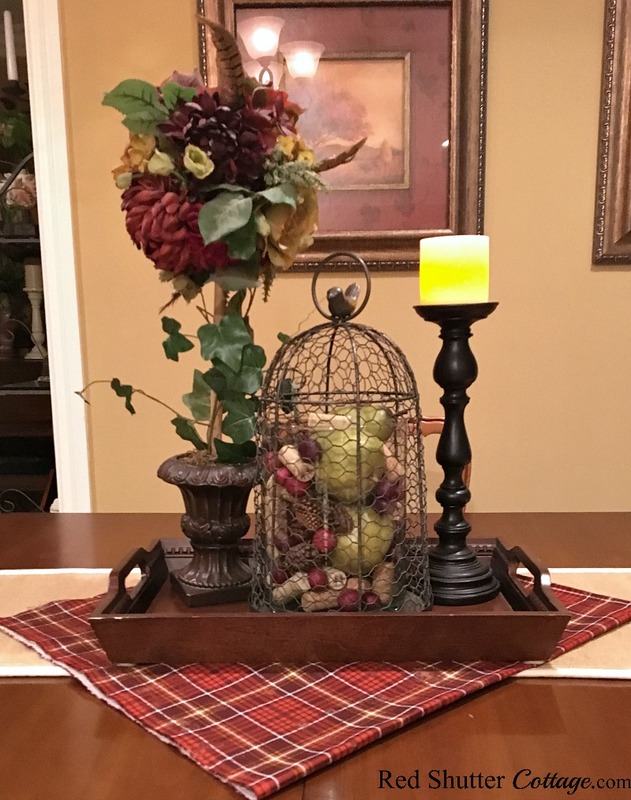 The “fall” items are an autumn runner, two fall glass & bead candle holders, a couple of baby-boo white pumpkins and fall-colored eucalyptus branches and pyracantha branches. COLOR: This vignette stays in the zone for traditional fall colors. The white is a nice contrast against the darkness of the wood tray and candle holders. For TEXTURE, the sleek finish of the ceramic vegetables contrasts well against the berries and the fabric. The fall foliage in the vase provides HEIGHT and VOLUME. And DEPTH comes from length of the table runner, and the width of the tray. In this next vignette, you can see that I re-used the eucalyptus branches, but this time they are combined with some sprays of fall leaves. The everyday items are the candle holders with battery candles, a basket, a pitcher and a burlap runner. The fall elements are the plaid runner, the leaves tied on to the candles, the basket full of fall fruits, grapes, and strands of bittersweet. Once again, the fall foliage provides HEIGHT and VOLUME. The COLOR range in this vignette is again the traditional fall hues of orange rust, and yellow with a little cream added in. This last vignette was part of my 2017 Festive Fall Home Tour, here. Again, every day items act as the support players. These include a dark wood tray (the same tray used in the first vignette), a cloche, and a candle holder with a candle, all of which are versatile decorating items that I use all year-round. For the fall elements, I added the topiary in rich neutral colors, and the pears, berries and wine corks that fill the cloche. (To be honest, I keep the topiary out all year round – I think it’s so pretty!) The COLOR range in this vignette is a tight grouping of green, maroon, brown, and cork (is that color?). It’s not the traditional “orange” color range for fall, so it’s a nice option if you are looking for an alternative to that. For VOLUME, we have the density of the cloche against the high, lean lines of topiary and candle stick holder. Since each element sits at a different HEIGHT, the eye travels easily over the whole vignette. For TEXTURE, the combination of bumpy pine cones and smooth pears provide a nice contrast. The different sizes of pine cones, maroon berries, wine corks and pears provide interesting DEPTH. 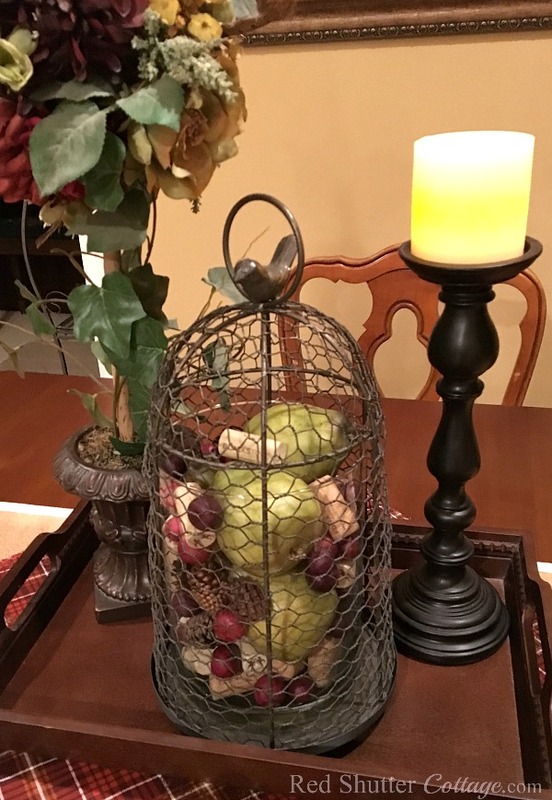 I’m a firm believer that seasonal decorating can be a simple combination of everyday items in your home, such as baskets, vases, trays, candleholders, cake stands, and candles, mixed in with seasonal elements to highlight the everyday items. For the Fall season, the elements that most quickly come to mind are picks, gourds, pumpkins, fall stems and leaves, garlands, fall fabrics and runners, pine cones, wine corks, leaves, and strands of berries. 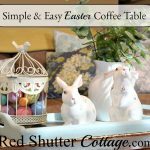 For more ideas on decorating items I use all year-round, please click here for my post, 5 Decorating Pieces I Use Year-Round. An excellent example of all of this is over at my friend Lynne’s blog, http://myfamilythyme.com. 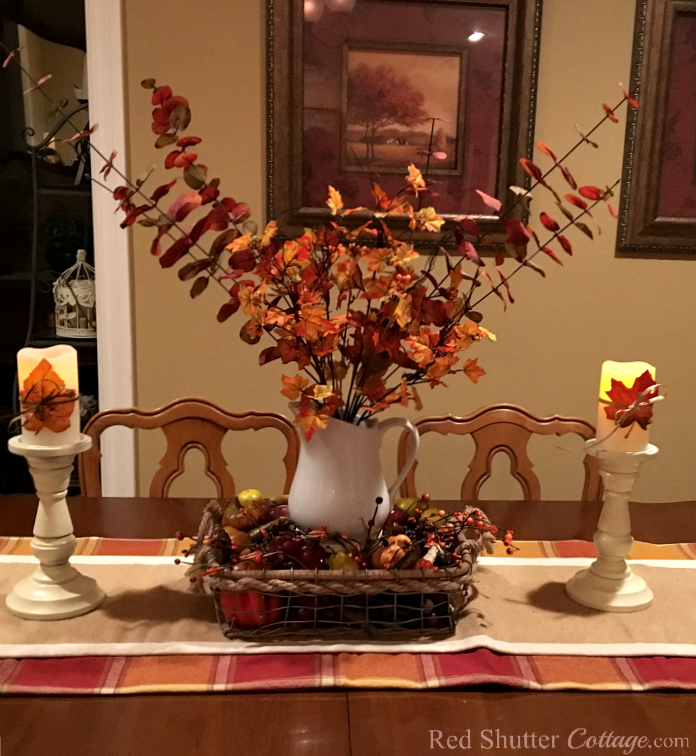 Lynne always does a beautiful job of incorporating seasonal elements into all areas of her home. 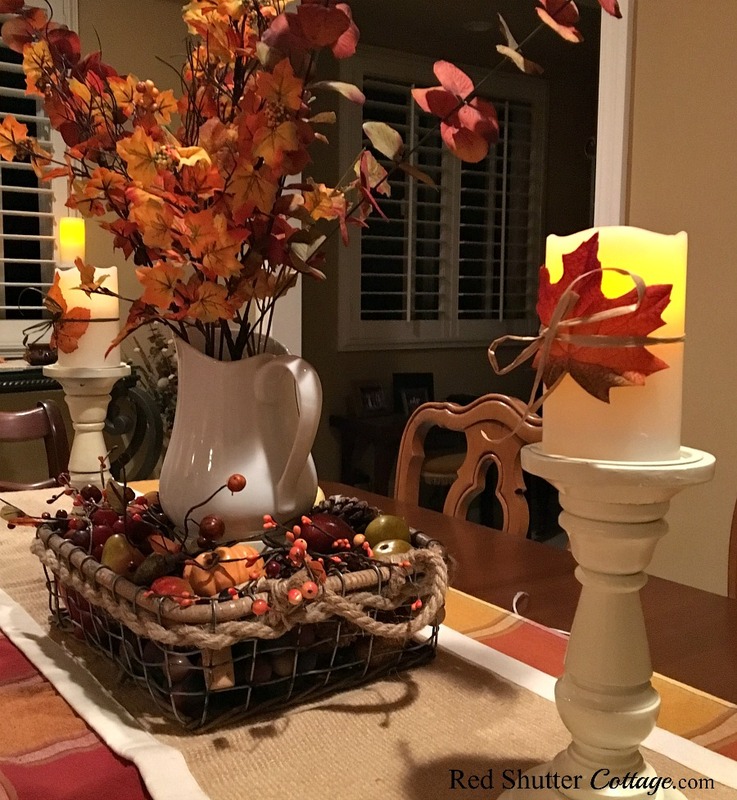 She uses everyday items mixed in with seasonal Fall items, making her home look festive and inviting. 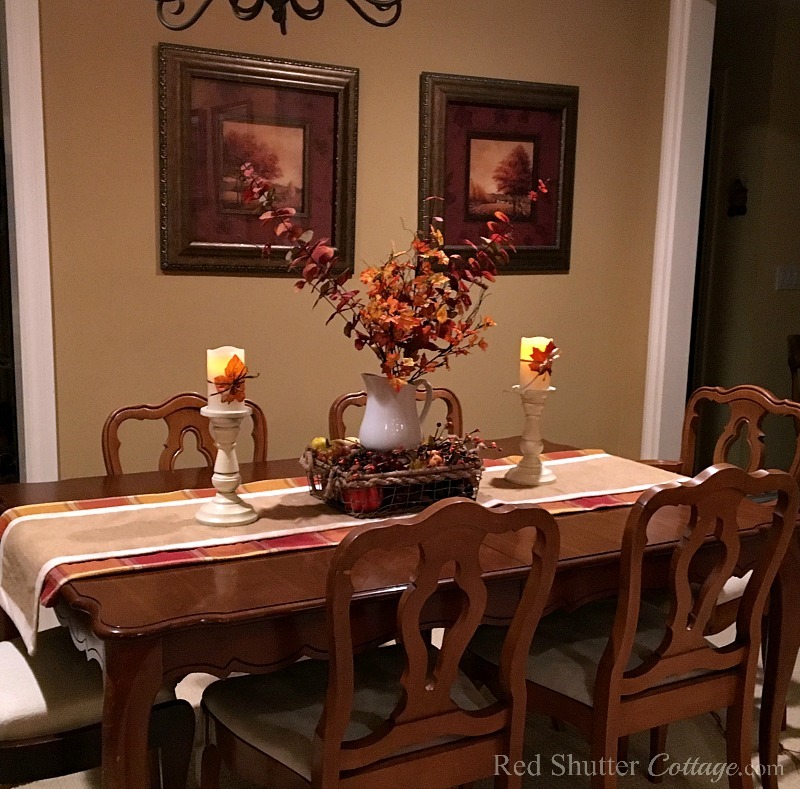 I hope this post has given you some creative inspiration to work with what you have to incorporate a seasonal feel, a little “Fall Flair” in your home. If you have any questions, please leave them in the comment section, and I will be happy to answer as best I can. Beautiful. I put together one very much like the one with the white vase. I gathered everything from around the house from things I already had and did it after seeing your post. I just cut a few leaves from the plant and put them on the candle with the rafia. Thanks for the great center piece idea. Sherry – I am so glad you found the ideas useful, and it inspired you to take action! That is exactly what I hope my blog does for anyone who reads it! Thank you for visiting! These are all really nice, but I prefer the ones on the trays. So easy to move if you need to. 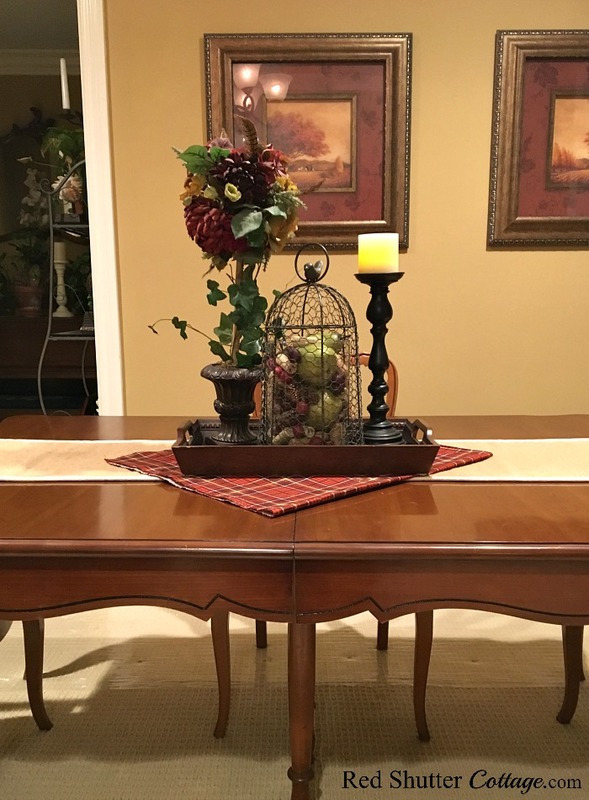 Although your dining table is separate and large so I suppose your able to keep your centerpiece through out the whole season. Thank you Leanna – and I agree! The ones on a tray are the easiest to move when the dining table is used. I like to do something on the dining table all year round. It doesn’t necessarily prevent us from using the dining table as “just put it here for now spot’, but it certainly helps!